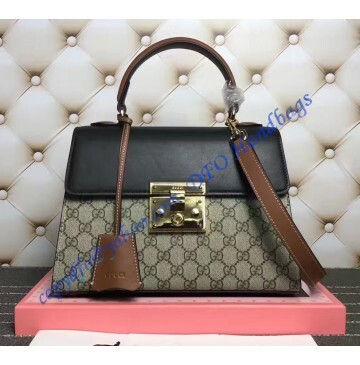 The design, features, and materials used in the manufacturing process, made this Gucci Padlock GG Supreme Top Handle Bag extraordinary. 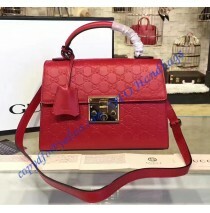 A good thing is the fact that you will know that your new bag is special. GG Supreme Canvas is specially treated and processed in order to meet the ultimate style, but at the same time to allow the owners to have a bag which will look like new for a longer period of time. Don’t expect to see signs of wear anytime soon. 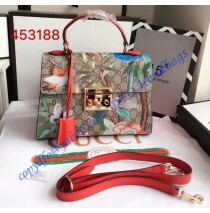 Inside, microfiber lining will make sure the bag is practical, but also durable. Smartphone pockets are a necessity and each bag should have them. Here, you get a larger one, so you can fit even the Samsung Galaxy S8 Plus or iPhone 7 plus. You won’t have problems reaching it either. The pocket is large and stretchable, so your phone will be safe and easy to get. A lock with a key is another element which we liked a lot. Here we have two, interesting facts. The first one is the metal, which is chosen due to low impact on the environment. The second fact is the safety. The lock cannot be opened without a key! Inside, you will get a zippered pocket and enough space to fit all essentials. The handle is introduced as a business accessory. 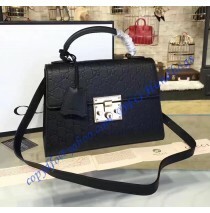 The bag will make you elegant and a business woman, when you want to, or help you with practicality when you need it.